I thought this month’s Can-Jam theme was definitely going to be apples, so I was very surprised when peppers were announced! I had already started planning to make an apple butter for the first time, which I’ll still have to try anyway. One other thing I had yet to try and make was a jelly. All of the preserves I have made this year were either a pickle or a jam (one mustard though – does that count as a pickle?). I’ve incorporated peppers into many of my recipes this year. I liked using their heat to add more dimension to some of my preserves, and loved the addition of chipotle to my BBQ sauce as well as ancho in my zucchini relish. But this time I was struggling with peppers as the main ingredient. I really wanted to try a jelly and searched around for different recipes to start as my base. One thing I kept encountering in most recipes was the inclusion of pectin; I’ve really tried to avoid using it, and luckily haven’t had anything that relied on it so far this year. So, I kept on searching and found that the answer to avoiding those packets of pectin lay in the ingredient I thought would be the theme – apples! I found a recipe online at Simply Recipes that looked and provided an excellent base for me to work with for my pepper jelly. The only problem that I ran into in following the portions listed was the thickness of the initial mash – I had to add 2 cups of water to make it loose enough to drip. This is probably due to the different levels of pectin in different apples, and that I also added the whole bag of cranberries which basically doubled the amount (hey, I didn’t want them to go to waste!). I also wanted to vary all the pepper flavors that I was working with, so instead of using only jalapenos, I added some habaneros and a poblano in place of the green bell pepper. You can vary the heat here by removing or adding the seeds in your peppers. I wanted to make sure my wife, not much of a chili head, would enjoy this so I left out quite a bit of the seeds. *UPDATE* I really enjoyed the flavor of this jelly. There was a good mix of chili flavors and they were all present. I loved the addition of the cranberries to help with the appealing reddish jewel like coloring. As soon as everything cooled down enough we gobbled up a jar, spreading it on a fresh baguette with some fantastic triple cream Saint-Honoré. I would have liked things a bit hotter, next time I may leave in the habanero seeds as well. 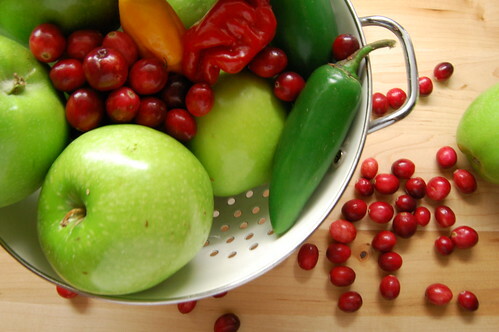 1 - Combine apples, including cores, peppers, cranberries, water and vinegar in a pot. Bring to a boil on high then reduce heat to medium-low to simmer for about 20 minutes. The apples, peppers and cranberries will soften. Stir occasionally to make sure nothing sticks or burns. Mash everything with a potato masher. 2 - Ladle everything into a sieve suspended over a large bowl. Allow it to sit for several hours (I let it go overnight). If the pulp is too thick and nothing is coming out you can add more water, you will want to end up with 4 cups of juice. 3 - Pour juice into a large pot and add the sugar (7/8 of a cup for each cup of juice). Heat gently and stir to make sure nothing sticks or burns. 4 - Bring to a boil. Cook for 10-15 minutes and skim off any scum. Start to test to see if the jelly is set on chilled plate (I put 2 plates in the freezer when I started to boil the juice). I also had a candy thermometer and pulled it when it hit 220f. 5 - Prepare jars and lids, ladle jelly into hot jars leaving 1/4 inch of head space and remove any air bubbles. Hot water process jars for 10 minutes. So, are you pleased with the result? Your recipe sounds like it is bound to be good and should have a kick. We loved it, I've added an update above. The heat was quite mild for my tastes, but it was perfect for my wife. I really wasn't sure how hot it would be and since I was afraid of making it blow-yer-head off hot, I left out a good portion of the seeds. Chili peppers have been hard to gauge this year since it was such a hot growing season. Some peppers that I normally would be fine with have been surprisingly extremely hot.